Greetings!! I am happy to report that I am back to normal!! After taking a few days off, I'm feeling great! I'm still on the Cipro for a few more days and have a slightly increased cough, but that's a 180 from last week. Just happy to be breathing and functioning as normal! Being that I am feeling better, we have a wedding to attend on Saturday and my vain self decided I better get tan! 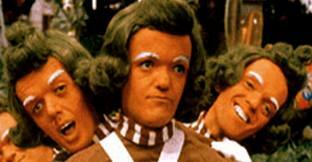 And, of course it back fired on me...I'm now a cross between an oompa loompa and Snooki - yikes!! Rather embarrassing - guess God thought he would teach me another lesson that tanning is not good for my skin. However, I always seem to ignore these lessons and do it again. So, I thought it might be wise to visit the dermatologist to make sure my skin is OK - so I'm anxious for my appointment in a few weeks. I'm just a bit paranoid about skin cancer now! Unfortunately, I don't really have much to report - guess that could be good too. The pups still have 2 more weeks on their medicine for their skin. Stella has recovered from her stunt at Pet Smart (I however am still embarrassed to go back). And Sarge is just a sweet and cute as ever!